Andrew Moore grew up in Lake Wales, Florida, just south of the pawpaw’s native range. A writer and gardener, he now lives in Pittsburgh, Pennsylvania. He was the news editor and a feature writer for Pop City, a weekly news e-magazine in Pittsburgh, and his stories have been published in the Pittsburgh Post-Gazette, The Daily Yonder, and the Biscayne Times. 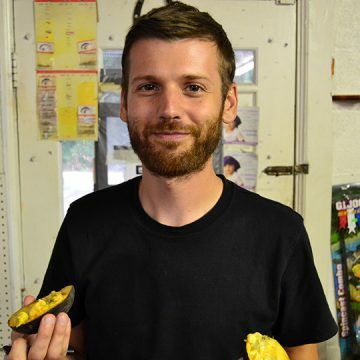 His first book, Pawpaw: In Search of America’s Forgotten Fruit (Chelsea Green Publishing 2015), is nominated for a 2016 James Beard Foundation Book Award in the Writing and Literature category.